Is Wallpaper Going Out of Style? When wallpaper first came out, it was considered the decorating material of the future. Nowadays through, many people are starting to replace wallpaper with paint because they think they can do most of the painting on their own. Even those that hire Minneapolis, Minnesota painters to work on their homes will avoid wallpaper because they think it looks dated and cheap. That raises an interesting question: is wallpaper going out of style? Is it still going to be relevant in a few years’ time? Let’s do a quick analysis to find out. Most people aren’t looking for the navy, maroon, and hunter green striped wallpaper that was apparent in every home in the 90s. That does not mean that wallpaper as a whole is irrelevant nowadays though. If you get the right kind of wallpaper to go with your designs, you can actually have a really nice look for your home that is more interesting than a plain painted wall. It’s all a matter of understanding the popular styles in modern homes. If you want to use wallpaper in your home, try using a pattern that is meant more for texture than imagery. For instance, you might put up wallpaper that looks like Venetian plaster, rather than a floral print that reminds you of Christmases with Grandma Betsy. If you want to use a bold pattern on your walls, try to reserve it for one wall. That will create a focal point for the room, much like a bold color or piece of art would. 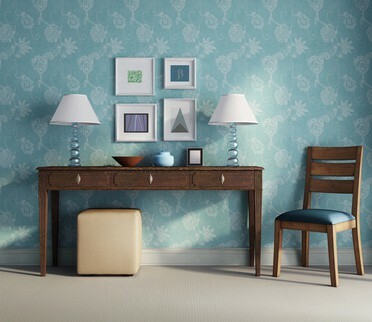 If you want to use the wallpaper all over a room, try to make the pattern small so it turns into a neutral background. You could frame it with trim pieces, and you could add accents throughout the room that have a similar pattern. If you would rather paint the home for simplicity’s sake, talk to some painters in Minnesota to see what your options are. Eventually you should be able to find something that works for you.